Commentary and all documents pertaining to the initial challenge launched by Club Nautico Español de Vela (CNEV). These documents include: the Protocol initially agreed by Société Nautique de Genève (SNG), the then holder of the Cup, and CNEV; the version of the Protocol as thereafter amended as a consequence, inter alia, of the parties' controversy with the Golden Gate Yacht Club (GGYC); as well as an arbitration panel award and a series of U.S. Court judgements regarding GGYC’s successful attempt to nullify CNEV's challenge and therefore become the ‘valid’ challenger for the 33rd America's Cup match. Commentary and all decisions (mainly U.S. Court judgements) regarding matters which became controversial between GGYC and SNG, leading up to the so-called ‘Deed Match’. 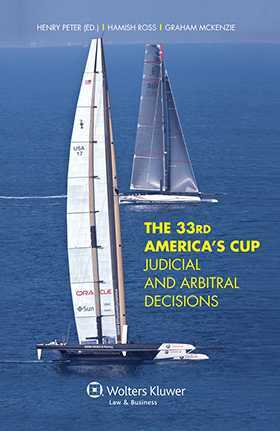 Commentary and decisions issued by the International Jury which operated during the 33rd America's Cup event. Commentary and documents executed by SNG and GGYC pursuant to which they eventually agreed to settle their disputes in 2010. A concluding chapter provides information and documents pertaining to the America's Cup trademarks and other intellectual property issues and to the management of the America's Cup, with suggestions as to amendments that could be considered to the current Deed of Gift. These latter comments are made with a view to limit the possibilities of new controversies and, if any arise, that these are dealt with by arbitration and not, by disruptive, lengthy, costly, and uncertain state court proceedings. In this way the book provides invaluable guidance for trustees, competitors, and event officials, not only for the America’s Cup but by extension to other major international sporting events. Chapter 3. GGYC’s Challenge: Deed Match. Chapter 4 . Custom House Registry Certificate, Applicable Rules, Venue of Match and Other Issues. Chapter 5. AC33 International Jury Decisions. Chapter 7. Management and Future of the America’s Cup. "Readers that are interested in sport arbitration will find this book fascinating. It is also excellent guidance for dispute resolution at other major international sporting events."